Jim and Bill, the Tobin brothers, are always seeking the road less traveled for their successful wine shop and bar in San Marcos. They cut their wine teeth in the old Long’s Drug chain in San Diego, then struck out on their own when opportunity rang, to purchase a wine operation in San Marcos eight years ago. They took North County Wine Company from an inventory of 300 bottles to 600 bottles in a short time. The only thing that’s holding them up from going to another 600 is space. Once on the floor, NCWC’s wines move out the door quickly with well-orchestrated consistent promotions and low prices. The Wine of the Week feature is always from an upscale winery with a price that’ll insure it moves quickly. With the current wines being snapped up and new wines priced to go out the door faster than they came in. At times, with new labels coming in, it appears they do have way more than 600 wines to sell. The fun starts on Wednesdays with the Wine of the Week revealed and tasted. Recently it was a “patio pounder,” the 2016 Napa Valley Pine Ridge Chenin Blanc-Viognier blend for just $9.97. You can always get a taste before you buy at the in-house bar with an always-fresh wine system pouring plenty of choices. 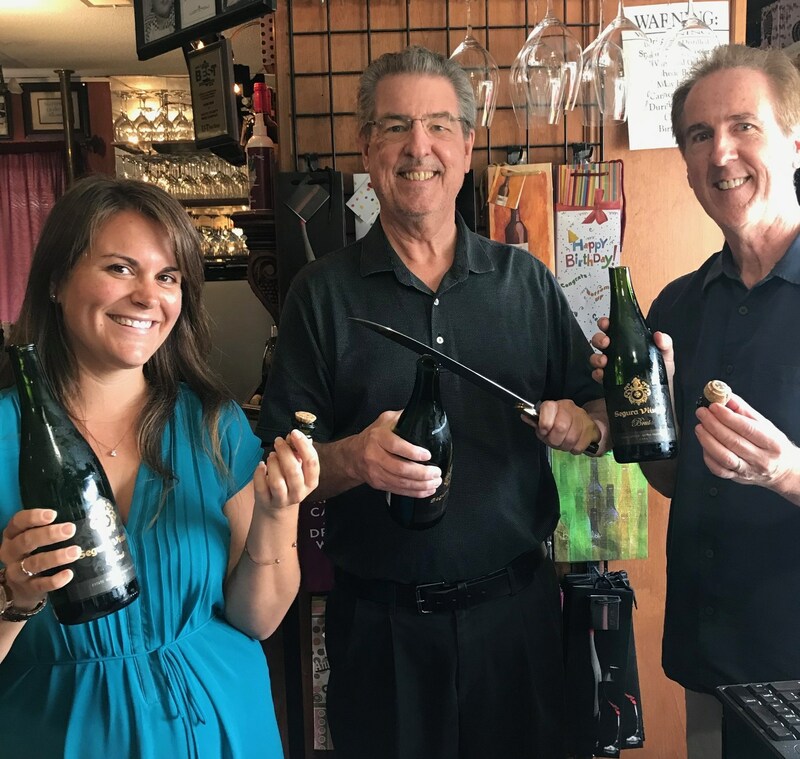 On the occasion of the wine shop and bar’s eighth anniversary held recently, the NCWC team kicked it off with a traditional saber ceremony, where the brothers and employee Cathryn Venettes, opened $250 French champagnes with the ceremonial swords, swiftly but carefully slicing the tops off the bottles. I told you they were one-of-a-kind! Why did they open their wines with a saber? It’s a tradition dating back to Napoleonic times and the French Revolution and it’s officially called Sabrage and considered a high honor for the ceremony of opening a bottle of sparkling wine. Here’s how it goes. At a right angle, slide a saber or similar blade down the neck of the bottle toward the cork, allowing it to hit the collar with a lot of force to snap the glass cleanly, causing the cork to shoot across the room with a pleasant sounding pop and a froth of fizz. There is a lot more to this fun event so Google “Sabrage” for the full story including safety precautions before you try it at your next birthday or anniversary party. When you visit North County Wine Company, you’ll want to enjoy their back patio which is shaded, has tables and chairs for outdoor sipping and a BBQ for some of the special events. Whether it be the Midweek Flight, Thirsty Thursday or Top Flight Friday and Saturday, the party never lets up. Check it all out at northcountywinecompany.com or call (760) 653-9032. Have you taken a journey through Italy lately and had its dining delights in some of its delicious districts? Il Fornaio in Del Mar would have been a wonderful way to learn about the authentic cuisine and wines of Campania. It recently spotlighted the culinary charm of Campania, from Naples to the breathtaking Amalfi Coast. Aglianico is the native red wine of the region. It is an explosive, intense body of dark cherry with aromas of ripe berries, spicy pepper, violet and prune. And there are delicious native dishes to pair with it. We found Pummarole a Capri with chopped heirloom tomatoes tossed with Mozarella di Bufala cheese, basil and extra virgin olive oil. The wine was a delightful Rosé. My favorite and one that most resembled the legendary entrees of Italy went by the challenging title of Strangulaprievete a Surriento. The ingredients included housemade Gnocchi with fresh Mozzarella cheese, Grana Padano cheese, oregano, basil and tomato sauce, all baked in the oven. 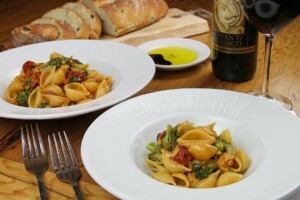 Aglianico wine is recommended with this rich dish. In September, Il Fornaio will unveil its menu for the district of Marche, on the third through the 16th. Don’t miss it! For details, call (858) 755-8876. • The Best of San Diego, an Italian Celebration is the event to be at. The location is at Gianni Buonomo Vintners Winery and Tasting Room, in the Ocean Beach District of San Diego, from 6:30 to 9 p.m. Sept. 15. A top-quality chef will create the feast and a new release Sangiovese will be the big new wine at the gala. The winery was awarded “Best Of” winery by San Diego Magazine. The Bordeaux-style blend Maestrale, a Gold Medal winner, will also be featured. Tickets are $55 each. For details, contact (619) 991-9911 or visit gbvintners.com. • Amici’s Ristobar in the Carmel Valley district of San Diego is the newest addition to a glamorous new group of food and wine friendly restaurants in the area. It is celebrating California Wine Month in September with a special event from 6 to 8 p.m. Sept. 18. This Wine and Bites event will be offering exclusive wines from Amici’s reserve cellar, along with curated bites. You can expect nine great California wines for tasting. Head chef Rohelle Gabriel has planned a tasting menu that is very unique. Tickets are $49 per person and reservations can be made at the restaurant’s Open Table page or by calling (858) 847-2740. • Seasalt Restaurant in Del Mar continues its winning ways with winning wine dinners. Next one up from owner Sal Ercolano is a dinner with Cakebread Cellars, at 6 p.m. Thursday Sept. 27 and Friday Sept. 28. Cakebread is Napa Valley’s celebrated winery and in my opinion the best Merlot winery west of Bordeaux. All wines are perfectly paired by Chef Hilario. Call (858) 755-7100 to reserve your place at this momentous occasion.